When I described Five Hidden OSX Gems a couple of years ago, I highlighted the flexibility of Preview. Even back in the days of Tiger, it was a hugely useful tool, and I bemoaned having to use operating systems that didn’t have it. Since then, it’s grown significantly in usefulness. I don’t know when the two features I’m about to describe were implemented (I suspect that one of them, at least, has been there since the beginning), but they’ve only become obvious to me recently. When I redesigned this blog I created several areas around the layout for the insertion of images. For these areas to work well, they require images of specific sizes (pixel sizes, rather than file size). After a couple of posts it became a real pain to do this resizing and cropping in the image editing applications I usually use, Photoshop and Pixelmator. Even with the relative svelteness of Pixelmator (relative to Photoshop), it can take a frustratingly long time just to crop an image. So it was with a slight air of frustration that I went seeking for a lightweight image re-sizer and cropper. I looked at a couple of products but none really fitted the bill. It was at that point I saw various people mentioning this functionality in Preview and, lo and behold, it’s there. Now this may not be hidden, in the true sense of the word, but it’s hidden in that I didn’t even think to look in preview for it. Preview comes bundles with what are some fairly advanced image adjustment tools. In the same style as iPhone, these aren’t pixel adjustments, but rather whole image adjustments. These tools include changing the Sharpness, Exposure and Contrast as well as colour adjustments like saturation, white balance, temperature and tint. You can also have a manual play with the levels. It’s pretty much the same tool as the one seen in iPhoto, so anyone who’s used to that will be right at home here. To bring up the Adjustments dialogue head to the slightly conservative “Adjust Color” item in Tools, or press OPTION+COMMAND+C. Cropping is predictably easy. Simply pick a Select tool (there are the usual rectangle, elliptical and polygonal varieties) and draw the area you want to crop. 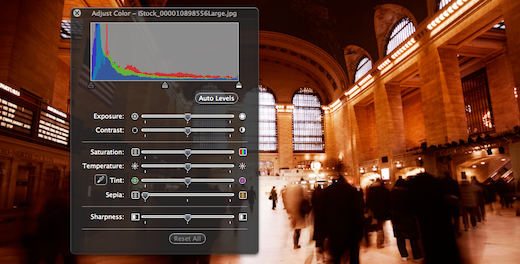 Then choose “Crop” from the tools menu, or press COMMAND + K. And there you have it, the image is cropped. Save it in the usual manner, and you’re done. Choose “Adjust Size” in the Tools menu to get a dialogue that allows for the image to be resized. There are the usual options present, allowing you to choose absolute sizes based on pixels or real-world measurements (e.g. inches), some presets and the option to lock the aspect ratio. OSX, unlike Windows, provides native PDF support. 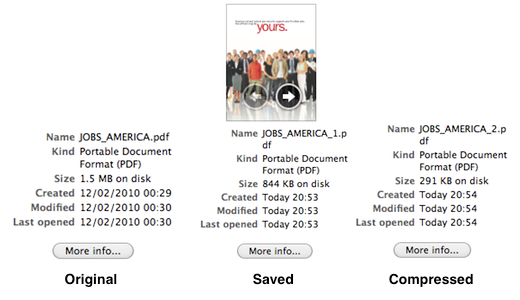 You can save pretty much anything as a PDF in OSX and Preview takes care of opening them once created. However, it doesn’t end there. OSX’s PDF engine is actually far more sophisticated than many commercial PDF creation tools. One feature of OSXs PDF engine that comes in particularly useful is its efficiency. You can take a PDF file and vastly reduce its size. To demonstrate this I took a random PDF file from my downloads folder (I’ve no idea where it came from, although I think it was linked from the brilliant Photoshop Disasters) and reduced its size. What the image above demonstrates is the original file’s details on the left and the reduced versions on the right. There are two levels of file reduction possible, one is lossless (i.e. there is no perceivable loss in quality post reduction) whereas the other is not. In order to achieve the first level of file size reduction, all you have to do is save the PDF in Preview. That’s it. So to reduce the 1.5MB PDF file seen here to 844 KB all you have to do is save it in Preview. That’s an almost 50% saving. To achieve the next level of reduction requires some work. Not a lot, just a couple of clicks in fact. To make the reduction, fire up the Save As dialogue. In this dialogue you’ll see a Quartz Filter drop down. This allows you to apply various effects to the document, one of which is “Reduce File Size”. Using this option when saving produces a dramatic reduction in file size. As you can see in my example, the PDF file’s size has now dropped to just under 300 KB. That’s one fifth of its original size and about one third of its already reduced size. A word of warning though. Using the “Reduce File Size” option can have some strange effects. Some of the images in the PDF lost their colours. All the text remained the same as before. So be careful and, as always, your mileage may vary. Are there any hidden Preview gems I’ve missed out on? This is a little powerhouse app.